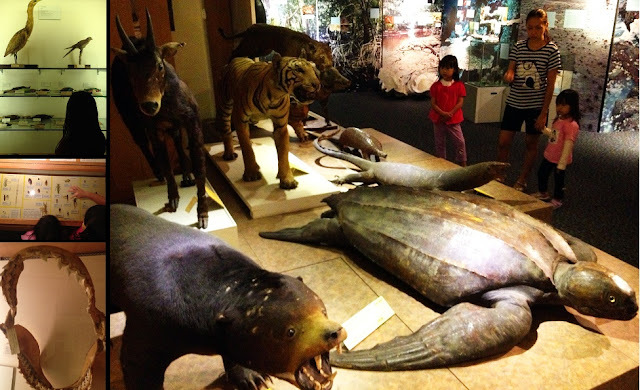 With Kids, We Go...: Raffles Museum: "National Treasures"
We had a dinner appointment in the west a couple of weeks back and decided to swing by the National University of Singapore to visit one of my favourite hangouts as a student: the Raffles Museum of Biodiversity. It was my honour to be the unofficial tour guide for my family as it was their first time at the museum. You need to make a trip there to understand why I call it the 'National Treasures'. The block is a five minute walk through a carpark away from the main road (Lower Kent Ridge Road), and upon reaching the floor, you would realise that the 5 room flat sized public gallery is tucked away in a quiet corner. We were the only visitors there at that time. The gallery was quiet, relatively dimely lit with spot lights on the exhibits. And what an amazing time we had. The children were intrigued by almost everything they saw, so much so that they went about 5 rounds and we spent about an hour in that small space. 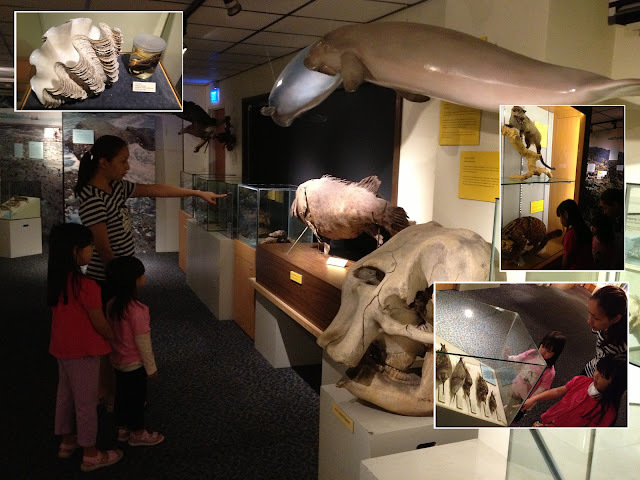 They were asking questions about the different animals, from why they were here, to what they ate, to where they lived. There was a small section on fossils and dinosaurs with some informative posters and some bones, which presented a brief preview of the arrival of the three sauropod skeletons to be housed in the new Lee Kong Chian Natural History Museum, which will open in 2014. 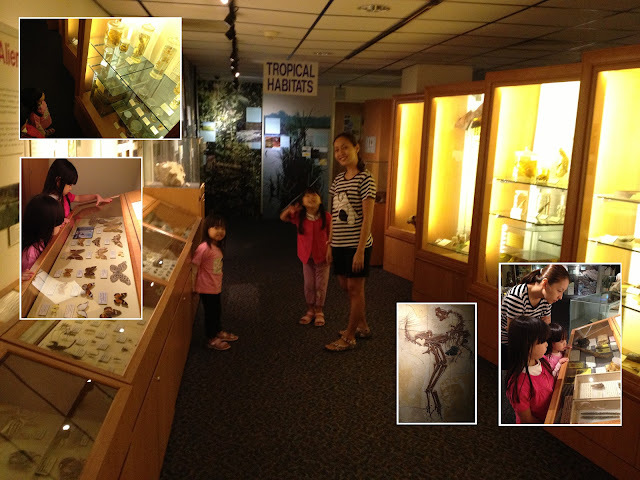 The girls were also especially interested in the insect and mollusk display cabinets. Aside from our personal encounter with the exhibits, I will refrain from going into the facts and figures, and stories behind them. These I'll have to leave you to find out for yourself during your next visit. I must add, however, that the exhibits placed in the public gallery are only a small representation of the tens of thousands of rare, unique and valuable specimens, some of which date back to the time of Sir Stamford Raffles, the founder of Singapore himself, who was an avid collector of specimens throughout his expeditions into the 'unknown realm' of South East Asia. Many of these specimens are often only viewed upon request by visiting researchers, but the collections are occasionally open to guided public tours, such as on International Museum Day. Needless to say, rapid development in Singapore has reduced the species count to about a quarter of that during the days of Sir Stamford Raffles, and it is indeed sad that the only records of some of these animals lie in the cabinets of this museum. You should be able to find more information on this interesting enclave with a simple Google search, but here are two sites to start you off.